We suggest NVDLA memory accesses are based on internal SRAM to achieve best performance and we designed BDMA for this purpose. Operation: Each individual BDMA transaction is called as operation. One operation may or may not trigger interrupt depending on software setting. take example above, transfer of activation, weight, mean, bias are 4 different BDMA operation. Group: group is consisted by one or more BDMA operations depending on software configuration. Set GRP<0|1>_LAUNCH as YES is treated as end of a group. Hardware will actually kick of all the “cached” BDMA operations in this group (by detect INTERRUPT=YES). After all BDMA operation done, corresponding interrupt will be generated. For below section, if there’s no special declaration, all address refers to data address in SRAM. Merge Convert the M-planar format to feature format. D_DECONV_STRIDE: The x/y stride relationship between input/output cube. It’s not necessary to configure those values the same as deconvolution stride. For split mode, DATAOUT_CHANNEL is used to specify number of channels needs to split thus it equals to output planar number. Dilation A technology to expand kernel coverage without introduce more network parameters. Channel Post-extension A method to improve MAC efficiency when channel size is too small (For image input only). Multi-Batch mode A method to improve MAC efficiency when atomic number in one stripe operation is too small (e.g. : InnerProduct layer). Weight compression A method to save weight data loading bandwidth. Comparing with full feature & weight, it has the same performance for single hardware layer, but weight can’t be re-used. Split H A software feature which utilize multiple HWLs to process an input data cube. It will be used when above cases are failed to match. The reason for 2*kernel_per_group is to keep CDMA and CMAC working at the same time to hide kernel loading latency, however, 1*kernel_per_group also workable but the performance is reduced. We can see only full mode is supported by convolution pipeline. If one network layer has large input which exceed the CONV_BUF capacity, software has to split the big input cube into smaller cubes in vertical direction. This mechanism called “Split H mode”. Be noticed that there must be max(R-stride_y, 0) overlapped lines between 2 consecutive cube to make sure the convolution results are expected. a) If this is the first layer (image input) and any item in Table 46 is satisfied, channel post extension should be used. 3. Decide the working modes by comparing actual data/weight size with available CONV_BUF banks. The priority is: “Full weight&input” > “Full input & Partial weight” > “Split H”. When split H mode used, it’s better split H into smaller one to make sure weight are all kept in CONV_BUF thus weight can be re-used. Before introduce the convolution pipeline programming, it’s necessary to explain the meaning of the registers and how they’re calculated. CC has 5 pipelines, each pipeline stage has its own registers. For any register, if it has the same name across pipeline stage, it means they have the same value. <CDMA|CSC>.WEIGHT/DATA_REUSE: Indicate whether or not re-use the weight/data from previous hardware-layer. If this flag is set, CDMA fetch will be fully(partially) skipped (depending on CDMA_HEIGHT of Nth layer and D_RELEASE/CSC_HEIGHT of N-1th layer: if CDMA_HEIGHTN <= (CSC_HEIGHT-D_RELEASE):sub: N-1 , the Nth CDMA fetch will be skipped). CDMA.LINE_STRIDE/LINE_STRIDE_UV: Those 2 registers are used for PITCH_LINEAR only, the value of those registers should be larger than the actual data per line. Actual data per line is different according to different input format and pixel format, please refer to: LINE_STRIDE/LINE_STRIDE_UV about its calculation. Besides, the requirement of alignment in Table 35 should also be satisfied. This field take effect for image input only. The override field does not directly change the sign bit of input values. It co-works with CDMA convertor. When convertor in CDMA is enabled, original values will be extended to int17 and then be calculated with offset and scaling factor. For example, if input format is R_8 and override field is UNSIGNED, the input value 0x87 will be extended as 0x00087 and sent into convertor. And if input format is R_8 and override field is SIGNED, the input value 0x87 will be extended as 0x1ff87 and sent into convertor. Sign override register field only affects INT/UINT pixel formats. Sign override register field should co-work with CDMA convertor. If CDMA convertor is not enabled, all values are treated as int8/int16/fp16, no matter how sign override is set. <CDMA|CSC>.D_BANK: Indicate number of banks allocated for data/weight. Please refer to: 10.1.3 about the calculation. <CDMA|CSC>.D_ENTRY_PER_SLICE: Entry per slice means how many CONV_BUF entries a slice occupied, it’s decided by multiple factors: convolution mode, width, channel size, stride, etc. Please refer to: ENTRY_PER_SLICE for detail. CDMA.FETCH_GRAIN: This is the threshold to trigger CDMA working: CDMA won’t work until the empty entries in CONV_BUF reaches (fetch_grain+1)*ENTRY_PER_SLICE. The values of this register is a trade-off of fetch efficiency and fetch delay: a large value will benefit fetch efficiency since CDMA have larger room when sending request, however, if this value is too large, CDMA will wait for a quite long time to wait CONV_BUF release enough entries. For LINE_UNPACKED mode, this register will be ignored by hardware and behaves as this register set to 0. <CDMA|CSC>.WEIGHT_BYTES: It should be configured as: weight_size=R*S*C*BPE*K. Regardless of weight compress mode or uncompressed mode. 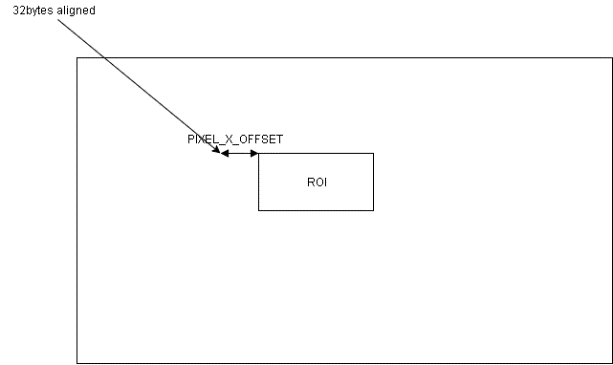 PITCH_LINEAR: The address configured to D_DAIN_ADDR_HIGH/LOW_0 should be 32bytes aligned, however, the start address of an ROI might not aligned to that address. Then, PIXEL_X_OFFSET is introduced. CSC.D_RELEASE: Hardware uses this field to decide how many input slices should be released after current hardware layer. Deconvolution is a software feature, but it’s necessary to mention the basic flow here to help user understand how it’s supported. This phase includes conv_stride_x * conv_stride_y hardware layers. The output cube from phase I is not the order we want, Rubik engine should be employed to reorder it. It has better performance, here’s a timeline diagram which shows method a) vs b). It shows b) is (stride_x*stride_y-1)*t1 quicker than a). Method b) has smaller memory footprint requirement (W’, H’ are the output width/height of each convolution hardware layer). For most case, stride_y>2 thus method b) has smaller memory requirement. Software has to prepare bias data cube, it has to be INT16 for INT8/16 pipeline and FP16 for FP16 pipeline. Software has to tightly pack mean/variance into one data cube (M0V0M1V1…), if mean/variance are 2 bytes per element there’ll be 4 bytes for a mean/variance pair. Those 2 bytes will be interpreted as INT16 for INT8/16 pipe and FP16 for FP16 pipe. SDP implemented compare mode in Y module to support software based redundant computing. After 3rd HWL execution done, SW should check D_STATUS to see whether difference found. As there’re bubbles between each data cube and the contents of those bubbles are un-determistic, we have to compare those cube one by one thus N HWL are necessary. Be noticed: The pseudo code in: 10.1.3 just configured to make hardware work, if possible, software should try to make sure the starting address (in/out or both) of each splitted band be 256 align, this will greatly improve NVDLA memory throughput. When hardware processing done, there’ll be interrupt fired from PDP submodule to inform CPU that PDP hardware layer is done for any of above mode. CDP always working on offline, there’s no special mode for CDP and the precision related configuration already discussed. So, skip the CDP programming here. After hardware layer processing done, there’ll be interrupt fired to CPU. NVDLA implemented debug registers to facilitate silicon debug. Those registers are dedicated per register group and won’t be cleared until the corresponding group starts. It will be incremented by 1 when certain condition meets. NVDLA is a fix function engine, the latency is predictable inside each sub-unit, but the read/write response from out-side is not deterministic thus we implemented performance registers below to help SW analysis the bottleneck of un-expected performance drop. For each sub-unit, we have “EN” register to allow software enable/disable those counting register to save power. Though we’ve already highlight hardware restrictions in the chapters above, but we’d like to centralize the limitations here to facilitate users quick check illegal settings. For 1x1xC cube, it should always be line_packed and surf_packed. Any read access or write access to reserved register address (0x14000~0x3FFFF) is forbidden. CSB master do not support for these addresses. Any access to these addresses may cause unknow result. WMB and weight data MUST has the same RAM type. If weight_format=compressed, banks_for_data+banks_for_weight must be less than 16 (Bank 15 is reserved for WMB). WEIGHT_BANK should be allocated large enough to store one kernel group weight plus 128Bytes; For compression mode, BANK for WMB is fixed as 1, this means WMB for one kernel group should always less than 32KB-128B so that additional 128Bytes can be stored in that bank. CSC:: RLS_SLICES: This register should never exceed DATAIN_HEIGHT_EXT, Even with the partial release in pervious layer, the unreleased slices will be counted into datain_height_ext of CSC register (but not in datain_height of CDMA register). For example, in first layer we input 10 slices and release 6 slices, there are 4 slices remain in CBUF. And with second layer we fetch new 7 slices from CDMA and combined with remain slices to do convolution. The setting of CDMA datain_height should be 7 and CSC datain_height_ext should be (7+4) = 11. And at this time rls_slices should not more than 11. The start address of each input feature cube has to be carefully arranged to make sure their offset is a fixed number as BATCH_STRIDE. If the value calculated by formula below exceed the INT32/FP32 representable, use INT32_MAX or FP32_MAX instead. When SRC is configured as REG, corresponding RDMA shouldn’t be enabled. If EQL mode is enabled, Y ALU convertor must be bypassed (except FP16) and all the operations after ALU should be bypassed. If PReLU is enabled for one sub-unit, the ALU in that unit MUST be bypassed. Maximum supported local_size is 9.